Those aren’t just painters you might have seen working this week on the sculpture along Seventh Street outside Cal State Long Beach — they’re also scientists, historians and artists. CSULB and the University Art Museum this year are marking the 50th anniversary of the California International Sculpture Symposium, the first of its kind in the country as well as the first on a college campus, and are collaborating with the Getty Conservation Institute to restore and conserve selected pieces on campus. Art conservationists are working on the sculpture along Seventh Street — by J.J. Beljon and titled “Homage to Simon Rodia,” who created the Watts Towers. The Long Beach Navy Memorial Heritage Association funded the $50,000 project via a grant. 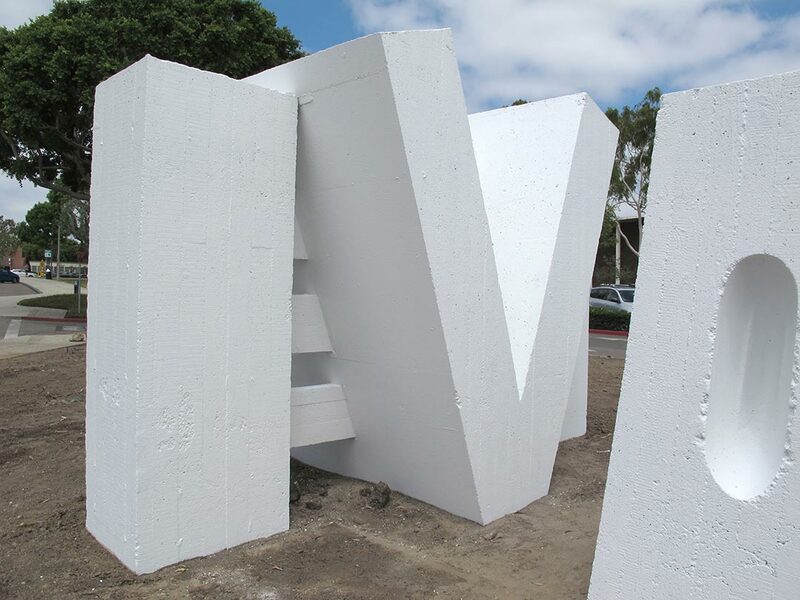 Beljon, who at the time served as director of the Royal Academy of Fine Arts, The Hague, in the Netherlands, created the largest piece in the 1965 Long Beach International Sculpture Symposium, made of 19 cast concrete components that spanned 130 feet requiring 260 tons of cement. Conservation involves crews stripping loose paint, cleaning the piece, applying a fungal inhibitor, addressing corrosion spots and filling bits of concrete loss, officials said. RLA Conservation of Art & Architecture is partnering with the campus on the project, and conducted the original survey of the sculptures. Rosa Lowinger, principal conservator at RLA, said restoration and conservation work on public art pieces took off in the 1980s, as works installed in previous decades started to show signs of deterioration. Modern materials, such as less toxic paint, may be used on the projects, but with a keen eye toward maintaining the aesthetic of the piece, Lowinger said. The important thing is, to take “into account the original intent of the artist,” she said. Christina Varvi, senior conservator with RLA, and a site supervisor for the CSULB project, said paint used to restore the Beljon piece is similar to that used on the landmark Hollywood sign. Conservation efforts require knowing when to stop tinkering with a project, she said. As part of the preparation, conservationists had to figure out what kind of paint was used to get as close to Beljon’s vision as possible, said Julia Langenbacher, a research assistant with the Getty Conservation Institute, which has provided scientific research on the project. “We took really small samples and put them under the microscope and used different techniques,” she said. The 1965 symposium, spearheaded by sculpture professor Kenneth Glenn and artist Kosso Eloul, featured nine sculptures on campus. The event highlighted new industrial materials and technology and was a collaboration with artists and industrial partners, including Bethlehem Steel, Fellows and Stewart Shipyard and North American Aviation. The symposium gained international media attention and birthed CSULB’s public art collection on campus, which has since grown to 26 works.